Did you know that the art of candlemaking is called 'chandlering'? 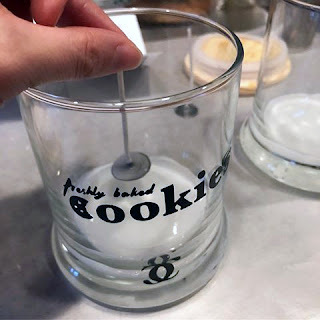 I am so proud of this 'Freshly Baked Cookies' candle scent mixture. I have to give Mark credit for helping come up with it- it really does smell like you just made a batch of fresh-baked cookies and it warms the feeling of the whole house. We thought of the concept while living in a hotel for two weeks back in January due to flooding issues, and I think were just wanting to think about cozy, comfortable things. I want to make mini ones (votives), change up the label, keep working on this. There's a place I like called the Foundery that I went to print and cut out vinyl labels. With the cost of a day pass, you get access to embroidery machines, laser and vinyl cutting, woodworking, screenprinting, and more! It's also a nice, diplomatic space to think creatively and relax. And you can get a big mug of Zeke's coffee and a hot dog while you work.